While it is common practice to wash and clean motorbikes to prevent rusting, not many people are aware that fuel tanks may also require cleaning and maintenance. If your motorcycle has been parked in the garage for a long time, its fuel tank may have started to rust. Using your motorcycle without cleaning the tank can lead to fuel pipe blockage or engine damage. Likewise, if you have bought a used motorcycle, it is prudent to thoroughly clean the tank before using it. Regular cleaning of the fuel tank of a motorcycle is also necessary to keep it from stalling and preventing engine issues. Since fuel tanks are not the most accessible of objects, cleaning them mainly requires the use of liquids and chemicals which can dissolve rust. Drain all the fuel out of the tank. You cannot clean it while it still has gas. Using a screwdriver, open the clamps and straps to remove the gas tank from the motorcycle. Refer to the manufacturer’s manual when detaching the tank. If you don’t have the manual then unhook any fuel or vacuum lines first, depending upon the brand and model of your motorcycle. Gas tanks on some motorcycles also contain fuel valves. If yours has one, remove it as well. Also check for the lower fuel sensor. Remove it as well if you find one. Pour a small bag of BBS into the motorcycle tank. Also add half gallon of diesel fuel to the tank and shake it vigorously. The BBS will remove the rust and any other gunk, while the diesel fuel will prevent the particles from setting down to the bottom of the tank. Open the lid of the tank and check if it is clean enough. If not, then close the lid and resume shaking until the rust and debris are removed completely. Pour the BBS and diesel fuel mixture out of the tank. Make sure the mixture has been poured out completely. Now thoroughly wash the inside of the tank with gasoline. Gasoline will remove all traces of the diesel fuel in the tank. 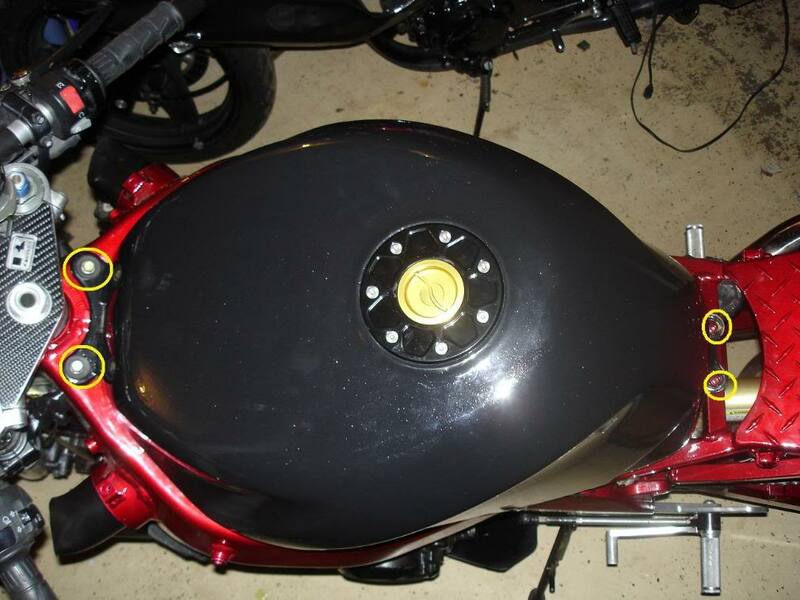 Your motorcycle tank is now clean and ready to put back on the motorcycle. Place the tank back at its position on the motorcycle and reattach the straps and clamps.